WHEELING, Ill. (WLS) -- Antonio Collins, Rakwan Crosby and Jasmine Garcia were charged in a robbery and shooting that injured two people in north suburban Wheeling. Police said Collins and Crosby, both 17, and Garcia, 19, were involved in an alleged drug deal gone bad in the 400-block of McHenry Road on Feb. 10. Preliminary investigation showed the three suspects allegedly contacted one of the victims to buy cannabis and planned to rob the victim. Police said at the meeting, one of the suspects pointed a gun at the victim and announced a robbery. They exchanged gunfire and the victim was struck in the chest. Authorities said the investigation is ongoing. 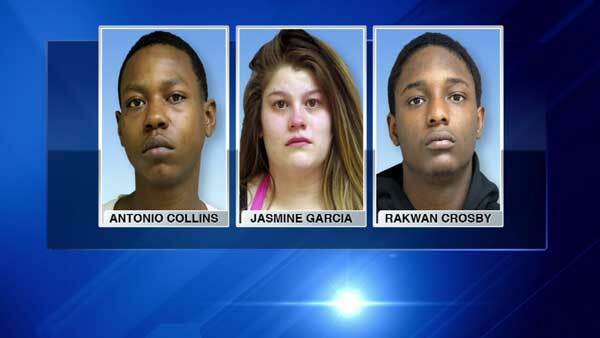 Collins, Crosby and Garcia were charged with aggravated robbery and aggravated battery with a firearm. Collins and Crosby were charged as adults. Collins, of the 500-block of Gundersen Drive in Carol Stream, is being held on $300,000 bond. Crosby, of the 1600-block of Larson Lane in Roselle, is being held on $100,000 bond. Garcia, of the 300-block of Glasgow Lane in Schaumburg, is being held on $50,000 bond. They are all due in court on Wednesday.